Submitted Photo Seated from right to left are outgoing officers: Barbara Albert, Secretary; Joan Larson, President; Skeeter Tower, Treasurer. Standing from right to left, Priscilla Bernatz, Treasurer; Joyce Haines, President; Dr. Minda Rae Amiran, Vice-President; and Leanna White, Treasurer. Missing from picture, Linda Dunn, outgoing Vice-President. Fredonia Shakespeare Club members celebrated the conclusion of the 2017-2018 year with an annual picnic at The Lanford House. Seventeen current members were in attendance. Following the luncheon served by the in-coming officers, out-going president Joan Larson thanked her fellow officers for their support over the past year. Barbara Albert gave the annual secretary’s report. Skeeter Tower gave the treasurer’s report. Past president Larson turned the meeting over to the 2018 – 2019 incoming president, Joyce Haines, who facilitated the process of completing next year’s schedule of hostess and presenter. Papers for the upcoming year will focus on “The World Between World War I and World War II.” Members chose dates for presenting their papers and dates to serve as hostess. 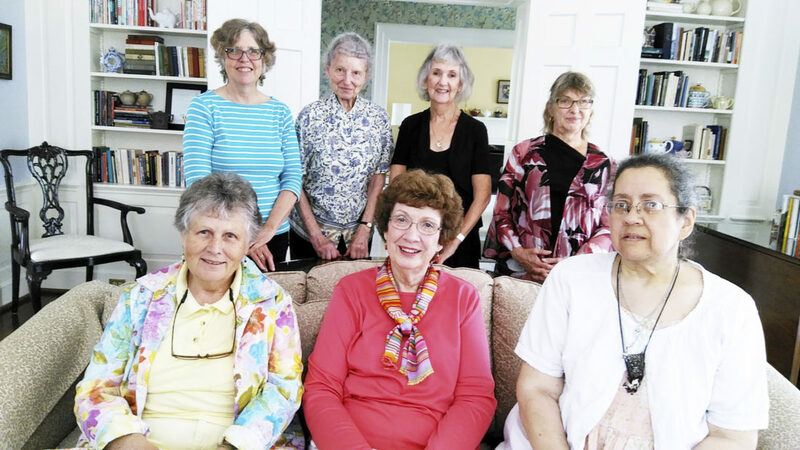 The Club’s new year will begin with the annual tea to be held on Thursday, Oct. 4 when speaker Dr. Eileen Lyon will begin the study with a brief historical and cultural overview. The Fredonia Shakespeare Club was established in 1885.